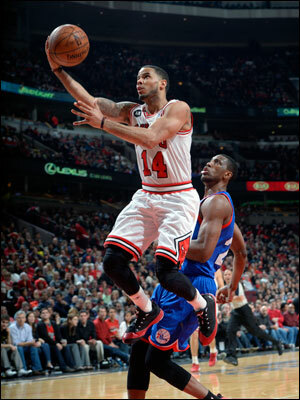 The Bulls Saturday defeated the Philadelphia 76ers 91-81 in a significant kind of game. And, no, not because of the 76ers’ 24th consecutive loss, the second longest losing streak in NBA history. It was yet another game that a Bulls’ team with nascent playoff aspirations was once again outplayed physically, on the boards, for loose balls and generally outhustled. Moving to 39-31 and in a virtual tie with the Toronto Raptors for third place in the Eastern Conference with a dozen games left in the regular season, the Bulls, nevertheless, are often beginning to look like a team headed for a short postseason. Indeed, the Bulls have shown in an unlikely and unexpected season after the loss of Derrick Rose and trade of Luol Deng they can figure in the Eastern Conference postseason discussion. They even have the most wins in the East since Jan. 1. But they don’t seem a threat the way they have been playing the last few weeks, though not in any great losing streak. Other than the win over Miami March 9, the Bulls have been mostly outplayed by the better teams and struggled to defeat the poor teams. They’ll get another chance Monday when the Pacers are at the United Center after Friday’s 12-point Bulls loss in Indiana. 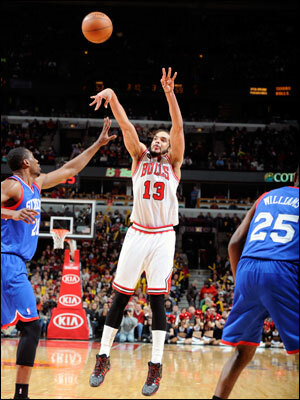 “Indiana was a tough game for us,” said Joakim Noah, who led the Bulls Saturday with 20 points and added eight rebounds, four assists and three blocks. “We wish we could have played better. We’ll have a chance to see them again soon. It’s exciting to play against the better teams and compete. The Bulls did win for the 16th time in 17 tries after a loss. And they got an all around excellent game from Jimmy Butler with 17 points, eight rebounds and six assists and tough defense on 76ers rookie Michael Carter-Williams, who shot three of 14. D.J. Augustin, with another fourth quarter of clutch plays, and Taj Gibson each added 16 points off the bench as the Bulls came back from trailing basically the entire first half. But there are big time warning signs ahead everyone on the team can see as the 76ers, a hodge podge of minor leaguers you probably could find in a local park, beat the Bulls on the boards 48-44, dominated them in second chance points 22-9 and outhustled and outworked them as the 76ers had a 40-26 edge in points in the paint with numerous dunks and layups. It would have been the end of the 76ers’ long misery had they not shot one of 20 on threes, which is how you get to be 30th in the NBA in three point shooting, which is what the 76ers are. But being outplayed on the boards, inside and in hustle is not a one time thing for the Bulls. It’s been going on much of this month, hidden in a few impressive wins over the Heat and Rockets. But consider these last nine games, six of which have been against winning teams, which are the kind of teams you see in the playoffs. The Bulls, a leading rebounding team for the last four years, have been outrebounded five of the nine games with one even. Opponents are averaging almost four rebounds more per game than the Bulls. The Bulls have been outscored in points in the paint in five of the last nine games and by a total of about three per game. The Bulls also have been outdone in second chance points, a category they usually own, six of the last nine games and by a total of about two per game. Not significant. Except when you usually dominate that statistic. The Bulls got an all around excellent game from Jimmy Butler with 17 points, eight rebounds and six assists and tough defense on 76ers rookie Michael Carter-Williams, who shot three of 14. Yes, it’s late in a long season and a place in the playoffs is basically assured. So perhaps you take a breath, especially with a team that works so hard so often. It’s natural. After all, Miami has lost seven of 11 and the Pacers have lost six of 11. Maybe it’s just that time of year. It’s possible. This is perhaps more so for a team like the Bulls. And it’s also why, though the record suggests otherwise, for the Pacers. You always hear how you have to win with defense in the playoffs. It’s true. But there’s less margin for error with teams that have trouble scoring. The Bulls remain the league’s lowest scoring team and after a little boost in January, the Bulls have scored 100 points three times in the last 28 games. The Pacers are 21st in scoring and in the middle in shooting. Teams like that have to defend and make every little play. The Bulls are barely making them anymore. It was shocking to watch the 76ers with not a single big man who could make the Bulls roster—Henry Sims, Byron Mullins and Jarvis Varnardo—absolutely bully the Bulls inside. Sims, whom the 76ers had to take back from the Cavs as they were discarding players at trading deadline because they were winning too much, had 15 rebounds and nine offensive. The Bulls starters combined for seven offensive rebounds. Varnardo, who was cut by the Bulls after one 10-day contract, had as many offensive rebounds as the entire Bulls starting front court. “Everyone is going through the same thing,” said Thibodeau, who predictably didn’t want to hear anything about being tired. “If you want to choose to say we’re tired… ninety percent of the rebounding is going to be will and determination. Are we going to go get it? The great rebounders are the ones who keep going. The more you go, the more you get. Right now we got to hit, hold and go. If we do that we’re going to be great. If we take any shortcuts, we’re not. This time of the year you can’t be taking shortcuts. Only Butler at 37.8 minutes per game is in the top 10 in the league in minutes played among Bulls players. Toronto, Washington and Indiana in the East, for example, have more players averaging higher minutes per game. There’s been this view that the Bulls have been better off since the trade of Deng. But his departure certainly could be one of the reasons the Bulls have fallen off lately in the defensive and hard playing categories. Deng was a versatile player who could defend the toughest opponents, rebound and make plays. It has to have a cumulative effect when you lose a player who does so much. 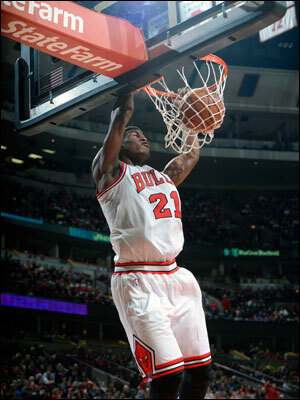 It’s to the credit of the players the Bulls have that they compete at such a high level. But you have difficulty sustaining in the long run when you lose players like Rose and Deng. It’s no secret to the Bulls players; it’s always just how much can they do to make up for the losses. For now, it seems to be hitting them harder. So once again the Bulls came out painfully stagnant, only an extraordinary number of free throw attempts against the 76ers disorganized defense enabled the Bulls to stay within 23-20 after one quarter with 25 percent shooting. D.J. Augustin, with another fourth quarter of clutch plays, and Taj Gibson each added 16 points off the bench as the Bulls came back from trailing basically the entire first half. The 76ers led most of the second quarter, though Gibson and Augustin, perhaps the two major surprise players of the season, gave the Bulls their first spark and a 41-38 halftime lead. The third quarter was a rare beauty for the Bulls offense of late with a flashy Mike Dunleavy lob pass for a Butler dunk, Kirk Hinrich with a couple of late clock jumpers, Dunleavy with his own slam dunk on a fast break and Noah with a self satisfying pair of jumpers as he danced back on defense. That gave the Bulls a 65-59 lead after three quarters. The 76ers made a little move to get back within five. But Augustin had a Magic Johnson-like ball fake on a drive for a layup, a strong finish on a Noah back door pass and a three to close it out after an earlier Hinrich three. Thibodeau has mostly gone with those two point guards in the fourth quarter along with Butler at small forward and Noah and Gibson, which has proven most productive in clutch stretch times. Still, it’s a team giving up deeper inside position than it generally has, being pushed aside on the offensive boards, coming late on help as happened against the Pacers Friday and without quite that edge they often point to; it’s a team working very hard for some narrow successes. “Every game is important because we’ve got to keep grinding,” said Noah. “Monday will really exciting. Right now we’ve just got to appreciate winning this game and come back with the right mindset and get ready for Monday. It’s often the Bulls; it will have to be again for them to have the success they seek.